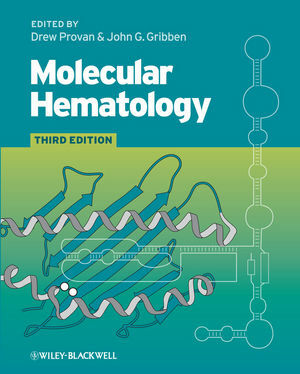 Now in its third edition, Molecular Hematology has been thoroughly updated to incorporate recent advances in molecular research. The aim of the book remains the same – to provide a core knowledge base for those with little exposure to molecular biological techniques. Presented in an extremely readable style with clear two-color line diagrams, this book is designed for the non-specialist and will be an invaluable resource for all trainee hematologists. 1 Beginnings: The Molecular Pathology of Hemoglobin (David Weatherall). 2 Molecular cytogenetics and array based genomic analysis (Debra M. Lillington, Silvana Debernardi & Bryan D. Young). 3 Stem Cells (Eyal C. Attar & David T. Scadden). 4 The Genetics of Acute Myeloid Leukemias (Carolyn J. Owen & Jude Fitzgibbon). 5 Secondary myelodysplasia/acute myelogenous leukemia – assessment of risk (John G. Gribben). 6 Detection of Minimal Residual Disease in Hematologic Malignancies (Drew Provan). 7 Chronic Myelogenous Leukemia (Alfonso Quintás-Cardama, Jorge Cortes, Hagop Kantarjian, Susan O’Brien). 8 Myelodysplastic Syndromes (M. Mansour Ceesay, Wendy Ingram, Ghulam J Mufti). 9 Myeloproliferative Disorders (Anthony J. Bench, George S. Vassiliou & Anthony R. Green). 10 Lymphoma Genetics (Anthony G. Letai & John G. Gribben). 11 The Molecular Biology of Multiple Myeloma (Wee Joo Chng and P. Leif Bergsagel). 12 The Molecular Basis of Anemia (Lucio Luzzatto & Anastasios Karadimitris). 13 Anemia of chronic disease (Tomas Ganz). 14 Molecular Basis of Iron Metabolism (Nancy C. Andrews and Tomas Ganz). 15 Hemoglobinopathies due to Structural Mutations (D. Mark Layton and Ronald L. Nagel). 16 Molecular Pathogenesis of Malaria (David Roberts). 17 Molecular Coagulation and Thrombophilia (Björn Dahlbäck & Andreas Hillarp). 18 The Molecular Basis of Hemophilia (Paul L. F. Giangrande). 19 The Molecular basis of von Willebrand Disease (Luciano Baronciani and Pier Mannuccio Mannucci). 20 Platelet Disorders (Kenneth J. Clemetson). 21 The Molecular Basis of Blood Cell Alloantigens (Willem H. Ouwehand & Cristina Navarrete). 22 Functions of Blood Group Antigens (Marilyn J. Telen). 23 Autoimmune hematologic disorders (Drew Provan, John W. Semple & Adrian C. Newland). 24 Hematopoietic Growth Factors: A 40 Year Journey from Crude “Activities” to Therapeutic Proteins (Graham Molineux and Stephen J. Szilvassy). 25 Molecular Therapeutics in Hematology: Gene Therapy (Jeffrey A. Medin). 26 Pharmacogenomics (Leo Kager and William E. Evans). 27 Gene expression profiling in the study of lymphoid malignancies (Ulf Klein & Riccardo Dalla-Favera). 28 An Introduction to Molecular Biology (Paul Moss). 29 Cancer stem cells (David C. Taussig and Dominique Bonnet). 30 Molecular basis of transplant (Francesco Dazzi).